My second book- Work Stronger– was recently published and became an Amazon bestseller, and people often ask me how to approach the writing process. Writing a book is a very exciting goal, but it can also be pretty overwhelming. Where do you even begin, right? Well, in this article, I’ll share the first three steps of the process that has helped me complete two 4-5 star books before my publishers’ deadlines. Then, in a future article, I’ll share the final steps in the process. Note: This series is strictly about how to write a great nonfiction book. I’ve never written a fiction book, so I can’t offer advice on how to do that. In addition, this series is not about how to market a book after you have written it. That’s a totally different topic for another day. Great books improve other people’s lives. There are many ways to make the world a better place, and writing a great book is one tangible example. Books can inspire us and change our beliefs for what is possible. Books can also educate us and shorten our learning curves. Think of how rewarding it would be to know that your book helped improve the lives of hundreds or thousands of other people. Knowing this brings me a lot of joy, and it can do the same for you! Writing a great book improves your life. Writing a book positions you as an expert on a topic, and it strengthens your communication skills and your ability to focus- both of which are becoming rare superpowers in today’s technology-driven, easily distracted world. Writing also builds resilience and discipline, and it’s the ultimate intellectual challenge. Who you become by writing a book is more valuable than any monetary rewards or public recognition that you may or may not receive. In reality, very few people get famous or rich by writing a book. If you are after fame or riches, writing is probably not the best way to get there. How long does it take to write a great book? Let’s be clear. Writing a great book takes a lot of time and effort. Some “writing coaches” promise that you can write a book in a few days or a weekend if you follow their magic formula. In reality, writing a great book is no different than getting and staying in incredible shape. It takes a lot of hard work and discipline, and it doesn’t happen in one weekend. If you just want to write an article or a 2,000 word eBook that is based strictly on your opinion, you could absolutely do that in a day or in a few days. However, if you want to write a traditional book (generally 50,000 words or so) that is based on extensive research and not just your personal opinion, that will probably take months, if not years. I mention this not to scare you off, but so that your expectations on timing are realistic. As with any big goal, one of the key challenges that you will face is staying positive and not getting overwhelmed by the magnitude of what you are trying to accomplish. Step 1: Identify your topic and your primary audience. If you already have a title and/or an outline for a book, that’s great. However, you don’t need a title or outline to get started. You just need a topic and a primary audience. Even that can change along the way. Some people get hung up on figuring out the perfect title or creating the perfect outline, and they let that stall their progress. Do you know anyone who has been talking for years about writing a book, yet who has not even begun or made much progress? Don’t become that person (or don’t be that person anymore). Just get started! Writing a book is a very messy process. Recognize that your final product will probably be pretty different than what you initially have in mind. That has been the case for me. Each of my books began with a general direction, and each evolved along the way. I just looked as far as “my headlights” though, instead of trying to envision the final destination and every single step along the way from the beginning. As for my two books… The topic of my first book (titled I Got My Dream Job and So Can You) is how to create your ideal career after college, and the primary audience is students and recent graduates. The topic of my second book (titled Work Stronger) is how to have more energy, less stress, and higher performance at work. The primary audience is leaders and other ambitious professionals. Step 2: Identify at least 10-20 sub-topics or FAQ. After you identify your book’s topic and primary audience, the next step is to generate a list of at least 10-20 ideas for “articles” related to your book. In Step 3, you will write “articles” for each of these sub-topics. For now, just make a list, and don’t worry about the order. What is the definition of a dream job? Note: If you can’t think of at least 10-20 sub-topics for your book, you might not really have enough material for a book. Your topic might really just be one article or a series of articles or a short eBook. That’s fine. You could still write, even if you don’t write a full-length traditional book- just like you could still run, even if you don’t run a full-length marathon. Step 3: Follow a writing schedule. Consistency is the key to long-term success in any endeavor, and writing is no different. In order to make steady progress on your book, I highly recommend that you follow some sort of schedule. If you only write when you are “in the mood,” progress will occur much more slowly. There are many different schedules that you could follow, and your schedule could change based on what else is going on in your life. For example, I started working on Work Stronger on Saturday afternoons while working about 50 hours a week as an executive recruiter for Heidrick & Struggles. Then, at one point, I switched up my schedule and wrote for 30 minutes a day for 30 straight days, as discussed here. Then, after getting a book deal for Work Stronger, I got approval to take a sabbatical from my job to finish my manuscript. Over a very intense three-month period, I then wrote every weekday- generally for at least 4-6 hours a day. If you have not started writing yet, or if you early in the process, you could start by blocking out one 2-4 hour block of time each week or one 30-minute window of time each weekday. Of course, you could pick something else instead. Look at it one week or one month at a time. Pick something that feels attainable. That might just be one hour a week at first. Increase your writing frequency or duration whenever you feel ready. In addition, you don’t need to publish your articles right away for others to see. At first, you might just want to store your writing on your computer, as you start working through some of your ideas privately. It’s up to you how public you want to be about this at first. On a related note, I also recommend that you identify a writing location. That could be a home office, a local library, or somewhere else where you can focus. I prefer complete silence when I write, so I never try to write or do any work in coffee shops, as they are way too distracting and noisy for me. However, that’s just me. You have to decide what works for you. If you were to follow these three steps and write 10 “articles” of 500-1,000 words each, you would have a great foundation for your book and be much further along than most people who talk about writing a book. This process has worked very well for me, and it can work for you, too. In my next article in this series, I’ll share the final steps to help you write a book of your own. Stay tuned! 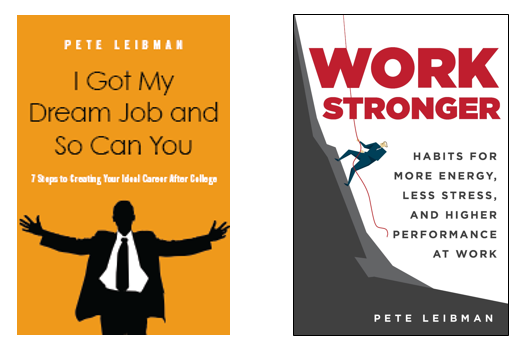 About the author: Pete Leibman is the creator of StrongerHabits.com and he’s the bestselling author of Work Stronger; Habits for More Energy, Less Stress, and Higher Performance at Work. Earlier in his career, Pete worked as an executive recruiter for Heidrick & Struggles, a leadership advisory firm who serves the majority of the Fortune 500. In his free time, he teaches one of the largest group exercise classes in the Washington, D.C. area, and he has competed in the Obstacle Course Racing (OCR) World Championships.